Previous post: More Summer Mystery Reading Fun From Penguin! 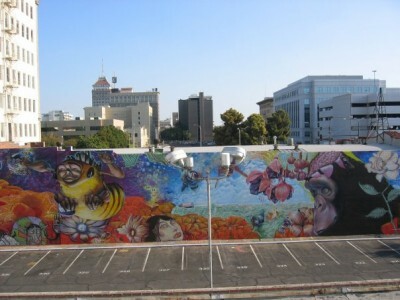 It is impossible to talk about the revitalization of the Tower District and Downtown Fresno without noticing the Mural District with its elaborate paintings and complex stories. Reza Assemi has been keeping an urban diary for 12 years. At age 17, he left Fresno and pursued business, hiking national parks, and a philosophy degree. When he returned to the Valley, he brought curiosity, creativity, and imagination and began to invest those qualities in creating something entirely new out of old things in the city. He has made a mark and is continuing to make a mark. Reza is the son of a custom builder and is a very good builder himself, but he is not satisfied just to build. His passion is to create space. If you are strolling through the Tower District of Fresno and wander into the downtown area, you begin to notice a presence. It is an expressive presence. It draws you in and causes you to take notice. Some of the walls actually speak. Neglected buildings are coming to life. New structures are forming that seem different from the norm. Art is visible and “in your face.” You have entered the Mural District. You have been invited to see, taste, feel, and participate in art appreciation and art creation. For Reza Assemi, it started with a love of old buildings, especially red brick buildings. Then the love grew from a passion to an obsession to bring people together through art and then to create community around it. 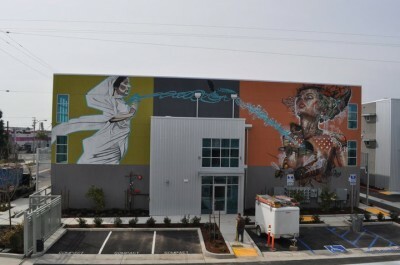 So much has been written about the Mural District in Fresno and its “spark-plug,” Assemi that it is difficult to know what to write or say that would be fresh or new. Reza is a visionary and a developer. He comes from a family of successful developers and has a background in building things. He knows how to do his family business well. What he discovered twelve years ago was that a building developer could become a community developer by creating intentional space designing that space to accommodate the people who would create community. For Reza, the unifying theme was and is art. He plunged into his dream after seeing a building that captured his imagination. Then, he found the artist in himself. He also came to realize that artistic people are great community developers. Art itself invites collaboration, appreciation, and transformation. Twelve years ago, after coming home to Fresno, Reza discovered his artistic self. He began to see art in common things like old warehouses and broken neighborhoods. 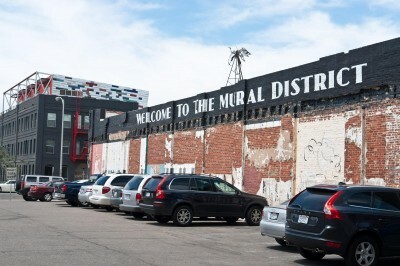 He had demonstrated competency in his craft, savvy in business, and now, using his knowledge, resources, and connections, he began to create spaces that made an unambiguous statement that these neighborhoods are art-friendly and artist-friendly. That is part of his vision for the Tower and downtown and he has pursued it for twelve years without wavering. His plans were big and he says that they needed a community push. The community has rallied with such organizations as Creative Fresno. Reza is committed to opening businesses and transforming community and the community itself does not underestimate Reza’s role. For years I have noticed the murals on buildings, but I had not looked into their origins. I decided to delve a little deeper and found myself overwhelmed with the history and the passion that has sustained this movement since the turn of the century. Sometimes there is just more information than one can digest. The artist-developer sees what others do not see. We see old buildings in neglected condition. Reza sees something special. As he said in a recent video interview, warehouses are special because they give you the opportunity to create something that people no longer recognize. Something has been transformed. Many factors contribute to the development of communities. One unexpected answer to the question of what has helped is a freeway. According to Reza, the 180 has made the Tower and downtown easily accessible bringing fresh life to these areas. In a world where freeways have divided neighborhoods, it is nice to find at least one that has helped to enhance a neighborhood. It is also of no small significance that downtown and the Tower are only two street lights away from each other. Once the people come together, amazing things happen. Projects that Reza Assemi has taken the lead in include The H Street Lofts, the Vagabond Lofts, The Iron Bird Lofts, and Broadway Studios. What is the next project and tablet upon which to paint? 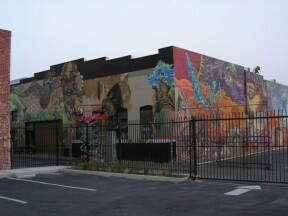 It is the purchase and development of the old “Theater 3” building where Reza hopes to create a venue for night life, acoustic guitar, and conversation. 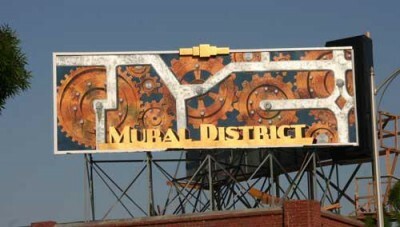 It is also known as the old PG&E building. There is always something new brewing in the mind of Reza Assemi. It has to be that way. 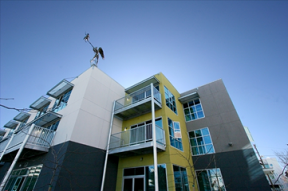 Read more of Tom’s Tower District articles here at KRL.